Jewish Voice for Peace is honored to feature deeply respected Palestinian organizer Rasmea Odeh at our upcoming National Membership Meeting. The meeting will be a critical place for 1,000 JVP members to craft strategies to resist the right-wing extremism emboldened by the leadership of President Trump and his mirror in Israel’s Prime Minister Benjamin Netanyahu, and to build community for the long haul. In both Israel and the U.S. the accusation of terrorism is used to stoke fear, dehumanize whole communities, and violently repress, incarcerate, bomb, deport, spy on, invade and occupy those communities and their homelands. Trump’s Muslim Ban comes out of the context of decades of this Islamophobic “war-on-terror” rhetoric which mirrors Israel’s decades of demonizing Palestinians. We are eager to hear from Odeh, a feminist leader in the Palestinian and Arab-American community in Chicago, precisely because she has survived decades of Israeli and US government persecution and oppression, and also because she lives and breathes the essential work of community organizing–having spent her life as both a lawyer and organizer for the empowerment of Arab women. The accusations against Odeh stem from a context of long-standing anti-Palestinian and anti-Muslim persecution by both the Israeli state and the United States, policies which are escalating under the Trump administration. In the 50 years of Israeli occupation, an estimated 750,000 Palestinians have been detained by Israeli security forces–constituting approximately 20% of the total Palestinian population. And the rate of conviction for Palestinians in Israel’s military courts is a staggering 99.74%, according to the military’s own statistics. Odeh’s arrest, detention, “confession”, conviction, and her subsequent persecution within the U.S. are inseparable from this broader context. In 1969, she was arrested by Israel along with her father, two sisters and 500 others and convicted of participating in bombings by the Popular Front for the Liberation of Palestine (PFLP) that killed two civilians. She later testified to a United Nations human rights committee in 1979 that she was coerced into signing a false confession after torture and sexual abuse by her Israeli interrogators and 45 days of detention. She has denied any and all involvement in the bombing. Rasmea moved to the U.S. in 1994, and obtained citizenship in 2004. She has worked with the Arab American Action Network since 2004, organizing primarily with Arab-American women on feminist issues. In 2014, she was arrested over a now 20-year-old immigration form where she failed to disclose her record of imprisonment in Israel. During her trial, the judge allowed evidence of her conviction in Israeli military courts to be used against her, while barring evidence of her torture, false confession and post-traumatic stress disorder. An appeals court has ordered a re-trial in order to allow that evidence, which will take place in May 2017. At JVP we mourn the loss of all life, and condemn all forms of violence against civilians. We also mourn the lives and freedom lost to a brutally unjust military court that deploys sexual violence, torture, imprisonment, and abuse. We can decry all acts of violence against civilians and also understand that–from Nelson Mandela to Assata Shakur–the label of terrorist is far from neutral. The story of Rasmea Odeh’s label as “terrorist” is a story of Israeli apartheid: a story of displacement and refugees, of occupation and unjust targeting by the security state, of political imprisonment, sexual violence, and torture. 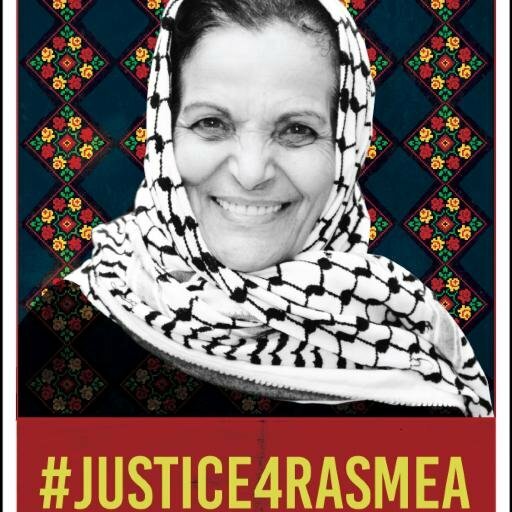 But Rasmea’s life is a story of Palestinian resilience: a story of persistence, of nonviolent resistance, of believing in community, of empowering women, and building grassroots leadership. We can’t wait to hear from her.